–Michael Burlingame, Abraham Lincoln: A Life (2 volumes, originally published by Johns Hopkins University Press, 2008) Unedited Manuscript by Chapter, Lincoln Studies Center, Volume 2, Chapter 29 (PDF), 3172. –Allen C. Guelzo, Lincoln’s Emancipation Proclamation: The End of Slavery in America (New York: Simon & Schuster, 2004), 189-190. Executive Mansion, Washington, Nov. 10. 1862. Yours of the 8th. was, to-day, read to me by Mrs. S[churz]. We have lost the elections; and it is natural that each of us will believe, and say, it has been because his peculiar views was not made sufficiently prominent. I think I know what it was, but I may be mistaken. Three main causes told the whole story. 1. The democrats were left in a majority by our friends going to the war. 2. The democrats observed this & determined to re-instate themselves in power, and 3. Our newspaper’s, by vilifying and disparaging the administration, furnished them all the weapons to do it with. Certainly, the ill-success of the war had much to do with this. I can not dispute about the matter of opinion. On the the [sic] three matters (stated as facts) I shall be glad to have your evidence upon them when I shall meet you. The plain facts, as they appear to me, are these. The administration came into power, very largely in a minority of the popular vote. Notwithstanding this, it distributed to it’s party friends as nearly all the civil patronage as any administration ever did. The war came. The administration could not even start in this, without assistance outside of it’s party. It was mere nonsense to suppose a minority could put down a majority in rebellion. 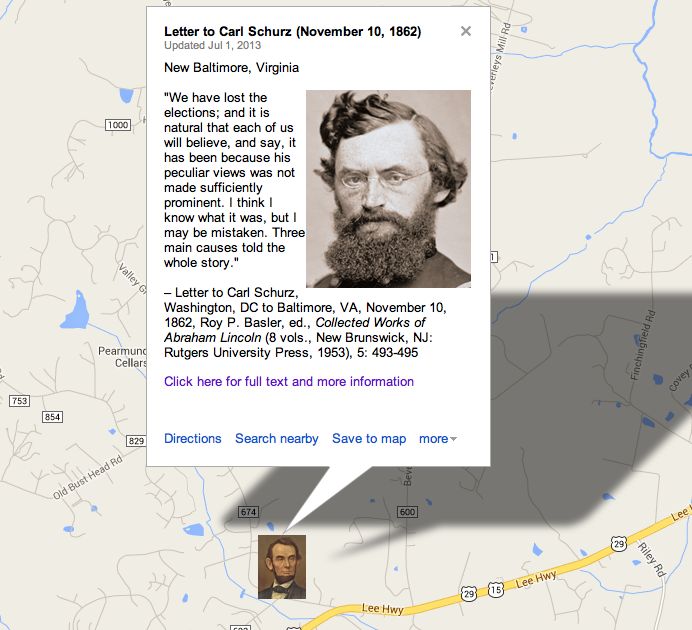 Mr. Schurz (now Gen. Schurz ) was about here then & I do not recollect that he then considered all who were not republicans, were enemies of the government, and that none of them must be appointed to to [sic] military positions. He will correct me if I am mistaken. It so happened that very few of our friends had a military education or were of the profession of arms. It would have been a question whether the war should be conducted on military knowledge, or on political affinity, only that our own friends (I think Mr. Schurz included) seemed to think that such a question was inadmissable. Accordingly I have scarcely appointed a democrat to a command, who was not urged by many republicans and opposed by none. It was so as to McClellan. He was first brought forward by the Republican Governor of Ohio, & claimed, and contended for at the same time by the Republican Governor of Pennsylvania. I received recommendations from the republican delegations in congress, and I believe every one of them recommended a majority of democrats. But, after all many Republicans were appointed; and I mean no disparagement to them when I say I do not see that their superiority of success has been so marked as to throw great suspicion on the good faith of those who are not Republicans.